I'm sure you all know how much I looooove ChickFila, so when I saw a sign outside that they were having a mommy/son date "knight" I was so excited. I thought it would be a great opportunity to spend a little one on one time with Brayden (and for Chris to spend some one on one time with Brody!). Last night was the big date. He was SO exited - he told me before we left that he wanted to drive the car and pick out what I was going to eat. I have no idea where he got that, it's not like Chris orders for me! I'd never go for that! But still, so adorable. When we got there the manager was dressed up like a court jester, and the cow had a knight in armor leading him around. There was also a live sax player and all the tables had black tablecloths and bouquets of flowers on them. 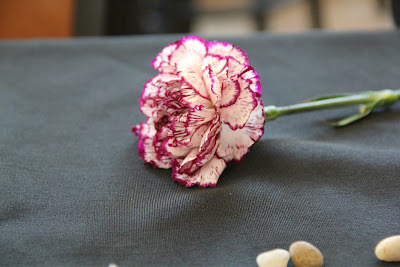 Each son got to give his mom a fresh carnation, and this is the one B picked out for me. He had a super fun time, and loved getting play in the indoor play place! 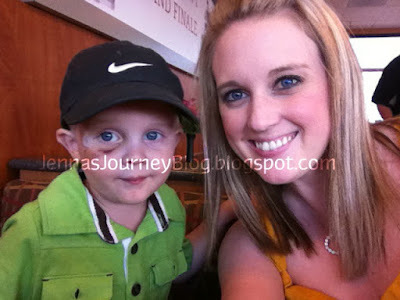 I can't wait to go on another date with my little big man! A day full of... Fish. A Baby Shower for my SIL & Niece!